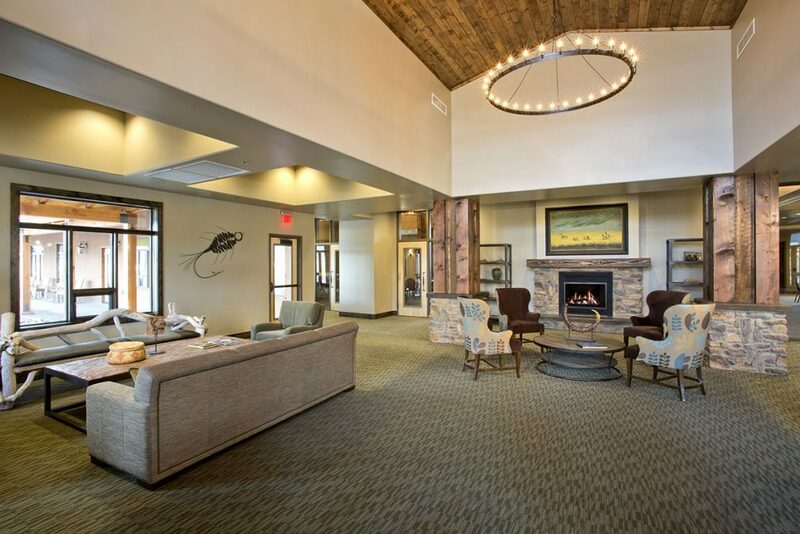 The objective for The Angel Fire RV Resort was to design an intimate and inviting resort experience for the valley’s summer and fall recreational vehicle guests. 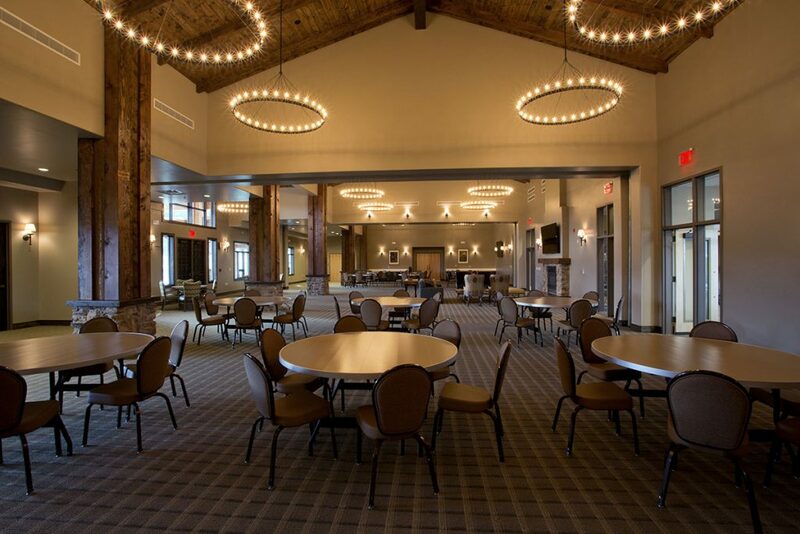 Building upon the identity developed for the Resort over the past decade that we’ve been working together, LDG composed a large clubhouse, bathhouse, and administration check-in building. Additionally, almost 20 acres of land was planned, including utility layout, roadways, RV slips, pedestrian walkways, landscaping, and lighting. 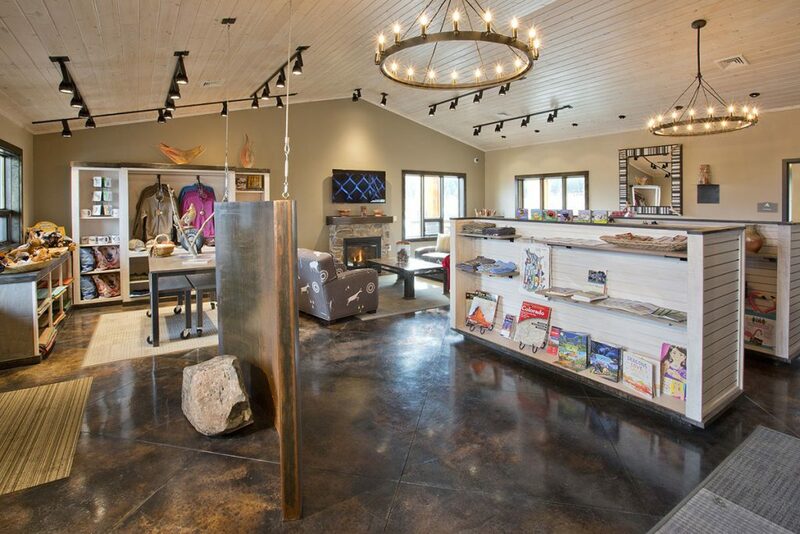 The space that RVs require to maneuver led Living Designs Group to solutions that start on large scale and gradually decrease to a human scale as guests transition from one area to another. The entry sequence greets and allows for the access of large RV’s then through engaging with staff the buildings transition to an intimate human scale. The planning and development of site systems and utilities required a level of planning and engineering usually reserved for a small village or town. The grading of the 20 acre site was balanced with the usable fill creating a landscape berm to the highway. The berm was integrated to develop a sense of intimacy, removing the short view of miscellaneous buildings and the highway, to enhance the long mountain view. 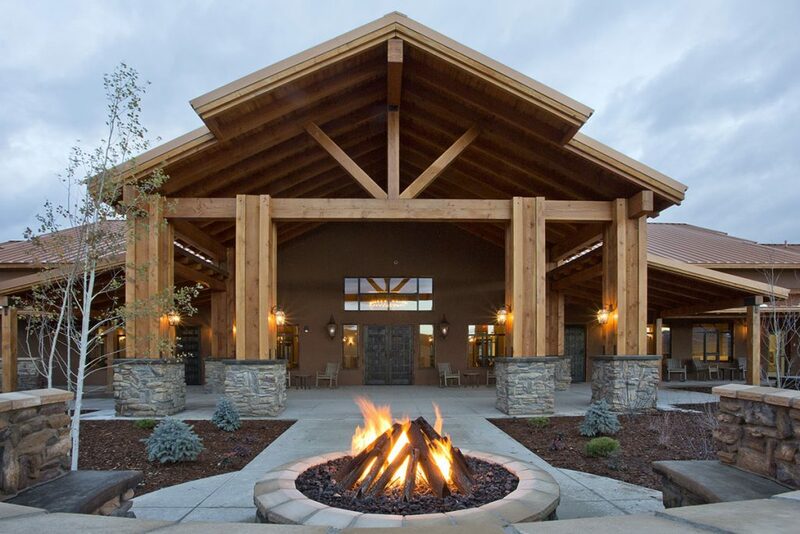 The grand entry structure demands attention from the highway and reinforces the scale of large RVs, framing the axis of the resort to focus on the clubhouse. The façade of the clubhouse has a large drive through drop off, again at a scale appropriate for RVs. 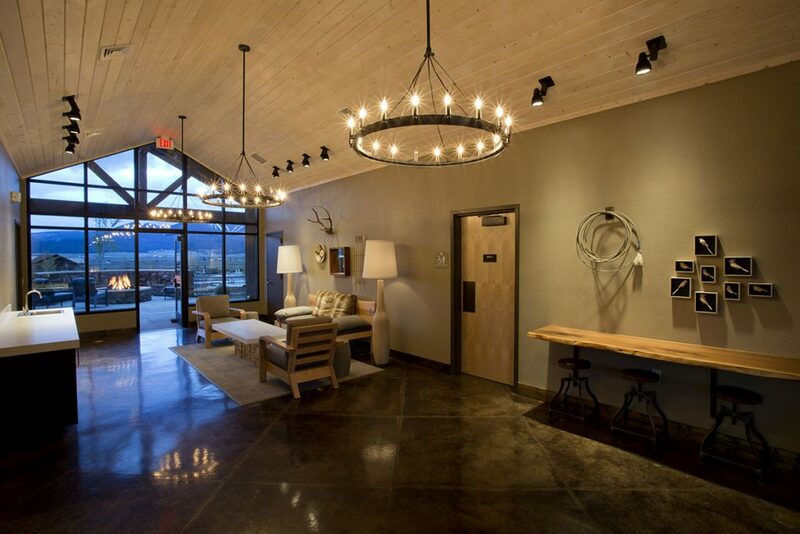 As you enter and move through the building, you are delivered to an intimate, yet luxurious residential environment including covered patios, fire pits, exterior fireplaces and sitting areas. The timber framed covered decks enjoy the short view of high alpine pastures and wooded foothills beyond. The bathhouse includes a large vaulted vestibule that frames a view to the mountains and an exterior fire pit. The facility includes laundry, bathrooms, and showers. 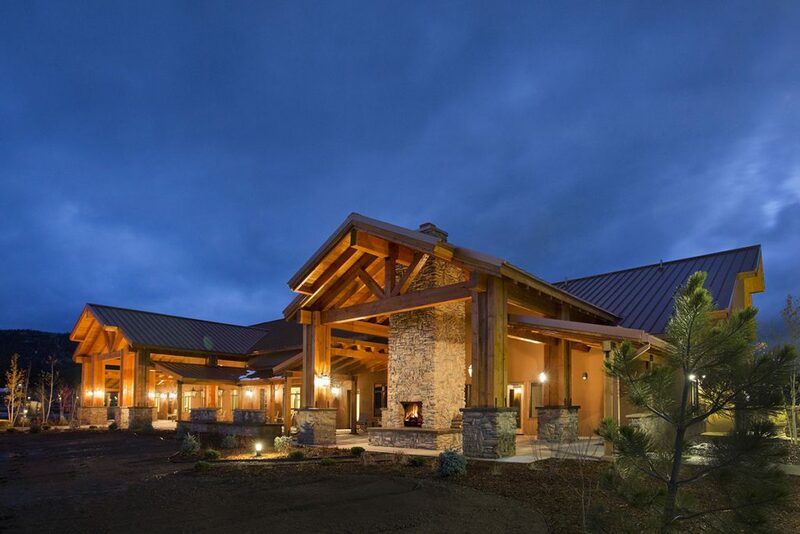 Amenities include a large foyer with beverage service and outdoor hot tub deck with spectacular views of the valley and the mountains beyond. The RV Resort is an important piece of the Resort Community for Angel Fire, allowing a large number of transient guests to recreate in a high cool mountain environment. This latest addition continues to develop the brand identity and lifestyle quality we’ve been building on from the beginning of our relationship.